A convex glass front and the convenience of simply hanging, plugging in and enjoying. Every room in your house deserves a beautiful focal point. 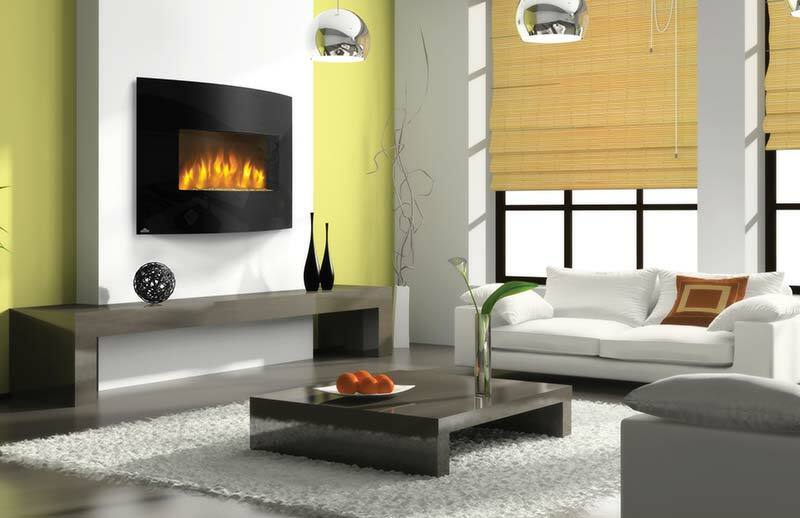 The EFC32H Electric Fireplace is the perfect addition to every room in the house to add that extra ambiance. A work of art in and of itself, you will wonder how you ever lived without its curvaceous beauty. The unit itself takes up little real estate. And save on your energy bill by heating the rooms up to 400 square feet, keeping the furnace at a lower setting. Mobile. Versatile. Hang easily, like a painting. The EFC32H can also be recessed into the wall and hard wired to hide the cords. This product is a child friendly way to add a room-heating fireplace anywhere. Easy to use and easy to care for. It is a maintenance free fireplace that can change the mood of every living space. The sweeping glass front does not get hot like a traditional fireplace, so there is no need for safety screens to impede the realistic flames. Worry not about little ones getting burned this unit uses high-powered LED lights. That also means the unit will keep giving you the brightest glow in the industry that will last over 15 years!